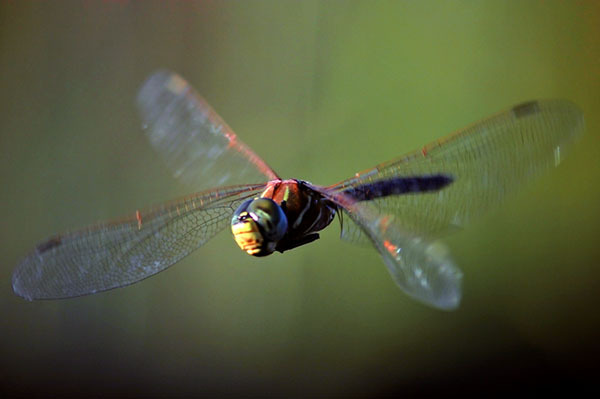 Dragonfly - master of flight. Lucky too; they will hover still enough to take a photo. I often thought about what it would be like to be really, really good at something. I'm a "jack of all trades master of nothing" meself; sometimes that got me down. Good at many things but not Really Good at any. Then I started to come across people who actually are Really Good at something and it made me realise that having a diverse set of skills is best. Why? Those who specialise seem to be one track minded. Everything revolves around that one skill. Sure, onlookers see an amazing skill and marvel. However, these "Masters" just don't seem to be interesting in anything else. The world, to me, is far too exciting to be lost in one tiny aspect of it. Sure, skipping from one thing to another won't make you a Master, but at least you are sampling from the diversity life has to offer. I'm glad I'm not a dragonfly.